A high energy band guaranteed to move your feet and rock the house. Steve Pfister Keyboards, Joel Mann Bass, Steve Orlofsky Saxes, Scot Allen Drums. Coco Montoya, The Derrick Trucks Band, David Raitt and Big Pete Pearson. Dan hails out of the L.A. and Philly Blues scenes and now resides in Castine Maine. 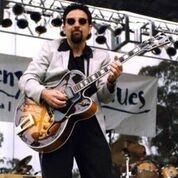 Dan Graziano’s musical career has taken many twists and turns, starts and stops and has provided him a long and exciting journey to his current destination as one of the most accomplished practitioners of the blues and American roots music. Growing up in Los Angeles, Dan started playing music of all kinds at the young age of 10. Songs about cars, surfing, “incense and peppermints” and everything in-between were what most young players practiced with their bands in the suburban garages of the 1960’s. When the British Blues Explosion made its way to America, it changed Dan’s direction permanently introducing him to the original recordings of giants like Muddy Waters, T-Bone Walker and Otis Rush. He also became immersed in the honest, stripped down and heartfelt music made by folk masters Townes Van Zandt and early Bob Dylan that dealt with the struggles of ordinary souls trying to make it through a sometimes cruel world. Dan’s live performance career has included sharing the stage with Shemekia Copeland, Keb Mo and Ronnie Earl. His soulful and sizzling guitar playing has electrified big festival stages as well as intimate clubs and roadhouses.